It’s the Happening meets A Quiet Place, and the thrill and execution here are pretty smart, and the movie still gets a little slow in its second half. This is a pretty cool movie that takes what other films have done in the past (the Happening, A Quiet Place, Invasion of the Bodysnatchers,) and runs with it. The concept is pretty solid and the thrills are definitely there. The only problem is that the gimmick gets a little tiring by the second half. There’s no question about it, the first half of this movie far exceeds the second. In the first half we’ve got a group of characters trapped in a house, being killed off one by one. In the second, the amount of characters are very limited and it’s about individual survival. The movie is still good, but it definitely loses some of its momentum as it goes on. 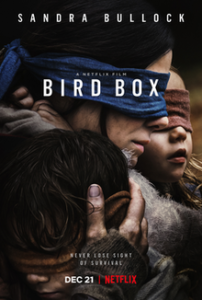 Bird Box is the new Netflix movie that has done tremendous business. In fact, it made more money than any Netflix film ever. We only know that, of course, because Netfkix told us, since they keep their own books and numbers and don’t release those things to the world. But what is certainly true is that tons of people saw the movie, it has been something in the pop culture that people have been talking about since December, and that with the one-two punch of this movie and Roma both being released in December, both on the streaming service, Netflix is cleaning up. But is the movie actually any good? Yes and no. It certainly isn’t anything vastly unique. There’s a plague of some sort in the air. People are more or less turning into zombies. The idea is that if you look into the sky, or even at daylight, something washes over you, and you suddenly want to kill your self. Immediately. And the few people that see the light and don’t want to kill them selves are out to get everyone else to see it too, uncovering windows, removing blindfolds, and things like that. So so it’s about avoiding the light and being blind. People wear blindfolds when they are outside, and when they are inside, they cover up all windows to make the rooms as dark as possible. But what exactly is outside? There’s no physical entity to this thing. It’s not a monster or group of monsters, which separates it from A Quiet Place, the similar sounding movie from earlier this year. That movie was about not using your voice. This one is about not using your eyes. But A Quiet Place isn’t the only movie this one has things in common with. The other one is The Happening, a movie that most people would like to forget. In that movie, people were also killing themselves for no explainable reason. And then the movie decided to start explaining it. Not in a here are the rules of these creatures kind of way, but more like here’s how this could really happen with the things around us. And the explanations were incredibly dopey. On top of that, the movie was riddled with bad characters and awful dialogue. Well, Bird Box makes none of these mistakes. It doesn’t offer us an explanation, and that happens to be a very good thing. All we need to know is how this situation, that is in the air, works. We don’t need to know why it works. The movie gives us as many details as we need, and that includes a giant flash forward to open the film up, which really grabs our attention. The flash forward begins the movie with Malorie, Sandra Bullock, in closeup, talking to two kids, about what they are going to have to do to survive. She talks about how they are about to get into a boat blindfolded, and how they cannot take off their blindfolds no matter what. 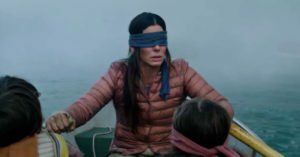 She calls the children “Boy,” and “Girl,” and then they board the row boat, all three of them wearing blindfolds, and get out into the water. The reason why this is such a giant flash forward is because when we now flashback to the actual start of the story, Malorie doesn’t have any kids yet. She is pregnant, and just going to the hospital with her sister, Jessica (Sarah Paulson,) for a checkup. And it’s the drive away from the hospital where things start really happening. This is where the virus explosion runs rampant through the streets. We see a firsthand account of how it all happens, through the mind of Jessica. Well, sort of. We don’t actually get to see what she sees, or anything like that, but we see Malorie beside her in the car and see everything from Malorie’s point of view. So that means we hear everything Jessica says, like “what the hell is that?” when she sees something weird while staring through the windshield. When Jessica stops driving and gets out of her car like a possessed psychotic, her fate is pretty much sealed. And that’s when Malorie goes on a run herself, trying to avoid the chaos that is taking place in the street, all around her. And she gets pulled into a house where some people are hulled up, trying to take refuge. This is a group of survivors, including John Malkovich, B.D. Wong, and Get Outs Lil Rel Howry. And Malorie joins the crew, which includes another pregnant woman as well. The scenes that involve this group, stranded together in the house, are pretty great. There’s a colorful cast of characters here, and of great actors who each bring something to the table. Lil Rel Howry, for example, bring the humor. And John Malkovich brings the anger, but also the reasoning. And the characters start to learn more about what’s out there, mainly through the deaths that strike members of their group. One character thinks he can watch things happening through the video feed of a security camera, and turns out to be sorely mistaken. Others decide to go on a run for food supplies, and get trapped in a car, packed tightly together, in one of the more thrilling scenes of the movie. But this film is a case where the first half far exceeds the second half. The first half of the movie is about the carnage and the second half is about things settling down. That includes the numbers of characters. By the second half, most of them have died, and we are really left with one man and one woman. And wouldn’t you know it, they start up a romantic relationship. Sure, times are tough and stressful, and these characters might need to unwind, but the problem is by spending more time on this romantic subplot than they need to, the story starts to slow down. And for a movie like this, which is pure adrenaline and excitement, slowing down is not. good thing. At around the halfway point or so, we also learn about people who get infected by the vision, and don’t try to kill themselves. Instead, they make it their goal to get others to see the vision, often at the point of fighting and killing those people who refuse to look, if they continue to resist. It’s like these people are working for the spirit, (or whatever it is, out there,) and are possessed. And what works about this is that it is a new threat, that appears in the second half. Changing it up to give us something new is always a good thing, and this movie is smart enough to know that. And pretty soon, we are back on the river, where the movie began, with Malorie and her two kids. To get from a place at the start of the film, where Malorie was still pregnant, all the way to the end of the film, where the kids are about five or so, means they skipped a whole lot of time. This is also a problem, although the film tries to hide it with a quick caption and nothing more. This movie does have some flaws, but for the most part it is a pretty smart thrill ride.